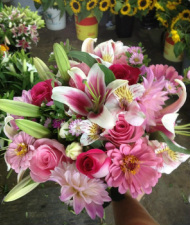 Whether it's a large wedding, or a small gathering, our certified florists can help you with all your floral needs. Everything from a quaint design for a dinner or engagement party, to the corsages and boutonnieres, right through to the bride's bouquet. Our floral service is unique because the cut flowers are grown right here on our farm. We have a large selection of flowers from Asters to Zinnias, and plenty in between to help make your day even more special. Due to the local growing conditions, the colour intensity is breathtaking. 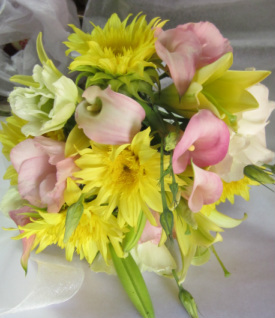 The flowers are cut one day and in the bouquet the next. How fresh is that?! Note: we can also source out-of-season or exotic flowers.